I’ve noticed lately, Classic Spinach Salad with Warm Bacon Dressing is making a bit of a comeback. And like most comebacks, there are changes. I loved the salad just as it was, so I went and dragged my old recipe box out so I could find my original recipe – from 1978. Yep. 40 years ago! That makes Classic Spinach Salad with Warm Bacon Dressing vintage, and me? Well, I’m an antique! If you’ve never had Classic Spinach Salad with Warm Bacon Dressing, it has roots stretching back to Germany and other Eastern European countries with the tangy, sweet bacon vinaigrette. That Warm Bacon Vinaigrette is just luscious and coats the spinach so beautifully. The spinach, in turn, is strong enough to stand up to the bold bacon flavor and to the warmth of dressing without actually wilting. It turns out spinach and bacon are a great flavor combo. The salad reads like a meal. The spinach gets tossed with the vinaigrette then put down as the first layer. Then it’s topped with all the goodies. There’s plenty of protein & so much more flavor with the hard-boiled eggs and the extra sprinkle of bacon. Mushrooms come into play next, preferably plain old button mushrooms along with a little red onion for just a bit of a bite. That’s it, the whole recipe in a nutshell. Just as it was given to me years decades ago, with no “newfangled” ingredients. There’s no special vinegar like balsamic, definitely no Dijon mustard, no poached or soft boiled eggs, no portabellas or other fancy mushrooms. Just plain old, honest ingredients. Just Classic Spinach Salad with Warm Bacon Dressing as it was meant to be. And this is exactly how I like mine, but if you want to gussy up or update Classic Spinach Salad with Warm Bacon Dressing in your own way, feel free. No judgment, here. Well, not much anyway, lol! The salad is deceptively simple for such a gorgeous salad. The vinaigrette is made right in the skillet the bacon is cooked in and if you take a minute to cut up the bacon before you cook it, it cooks in minutes. I like to keep my bacon in the freezer because I don’t tend to eat a lot of bacon and it’s a great way to keep a bit on hand for recipes. Just take it out before you start the hard boiled eggs and it will be soft enough to slice through and still frozen enough to slice through easily. About a half inch slice through the package (1/16th of the package) equals about one slice of bacon. As for your hard-boiled eggs, you can use the Best Basic Boiled Method, the Easy Peel Steam Method or make your Hard-boiled Eggs in the Instant Pot. I highly recommend either of the last two methods for easy peeling eggs, but it’s your call. And as long as you’re making a few, you might as well make more for snacking or my Best Egg Salad Sandwiches. Just sayin’. Alton Brown did a few experiments on mushrooms – and he says its ok to rinse your mushrooms. If you’re more comfortable just brushing the dirt off, that’s up to you, too. The only ingredients we haven’t covered is the red onion. I love the sharp bite, but if you find it strong, soak the slices in cold water for 10 minutes or so. It really tames them down. The spinach is so much cheaper than it used to be, but it’s even cheaper in the bundle instead of by the bag. It kind of defies reason – the bags look so much larger but they’re filled with loose, not bundled spinach. If you’re determined to buy spinach in a bag check Costco or Aldi. The priciest item is the bacon and you’re going to find the best prices around any holiday and especially any holiday where brunch is usually served. Stock up at a low and stick it in your freezer where it keeps beautifully for months and takes up little room. It’s best to not be too particular about brand names when looking for sales – you never know what will pop up at a great price. Eggs, too, are a great holiday item and they can be found at an excellent price, too, at Aldi (for smaller packages) or Costco (in larger ones.) Eggs keep for weeks in the fridge past their “buy by” date. Look for mushrooms on sale, too, especially around holidays when they’re usually half off – they don’t keep long, but if you want to keep them a bit fresher, turn the package upside down and poke a few holes in the bottom. That’s going to keep them out of the condensation that they’re most likely sitting in and make them last a smidge longer. Feel free to add as much or as little of the bacon, eggs, spinach & onion. While you’re at it, feel free to tinker with the dressing, too, adding more or less sugar, salt, pepper. Add bacon to cold skillet and turn to medium heat. Cook, stirring often until done to desired taste. Remove bacon and set aside. Remove all but three tablespoons of the drippings. If there aren’t three tablespoons, add a bit of vegetable oil. Place the bacon in a medium nonstick skillet and fry over medium heat, stirring occasionally, until crisp, 8 to 10 minutes. Add spinach to a large bowl and toss with a little of the warm dressing. Divide into serving bowls, garnish with egg, mushrooms, onion and reserved bacon. Pass the remaining vinaigrette. This entry was posted in Click here for Bargain Meals, Click here for Fabulous Food Posts and tagged Bacon, Eggs, German, hard-boiled eggs, Main dish salad, mushrooms, Red onion, Salad, Salad Dressings, Spinach, Spinach Salad. Bookmark the permalink. I’m so glad you liked it, Kim!! And thanks for taking the time to stop back and give a shout out! This spinach salad looks so delicious. You always come up with a recipe which is perfect. Thanks for sharing at Fiesta Friday! Thanks, and thanks so much for hosting for us this last week! This was definitely a staple in my house growing up, yum! It seems to be pretty universal! I use to make this salad all the time and then moved on to a sweet and sour dressing and an Irish Mist dressing. Maybe I need to try this again after a long absence… Thanks for sharing with Fiesta Friday. I had really kind of forgotten how good it was/is! That Irish Mist dressing sounds interesting! Your dressing was the first way I had a spinach salad and as we always say anything is good if bacon is in it! The Irish Mist is my Dad’s recipe – liqueur in it but very tasty! It sounds like he was ahead of his time the way everyone is putting whiskey and bourbon in recipes now! I’m probably more antique than you. My mother made this so many times during the summer months it was almost a dinner staple. We had no air conditioning and salads were light, easy, and refreshing. Thanks for this recipe. Oh gosh, yes, do i ever remember the no air conditioning days!!! A salad like this would be perfect on any hot day, and the bacon, I think carries it into fall, too! This is one of my favorite kinds of salads! 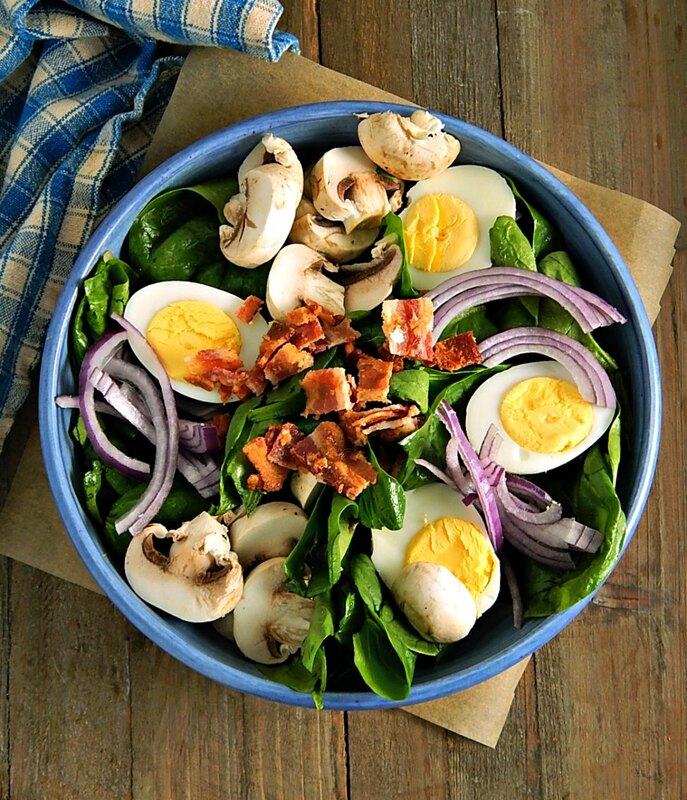 The warm bacon dressing goes so good with the spinach and other ingredients! Your salad looks super good! Thanks Nancy! I actually want it again, but I have another use for the rest of my mushrooms and bacon. Maybe I’ll just have to go back to the store. Such a beautiful salad and your photos are amazing! That salad is just begging me to devour it! I love that beauty! Thanks, Julie! I bet you had this a few times in the past, too! I can’t remember enjoying a salad as much for quite a while! Must be the bacon, lol! An awesome classic. It looks delicious and is a great reminder. Love your tips too, Mollie! You can never go wrong with bacon, right?! Wow, this brought back memories. I used to go to Marie Calender’s in SLC, and order what they called a wilted salad. I don’t remember the ingredients, but the wilting aspect was wonderful, and helped me get started eating salads. Fabulous! My Grandma used to make wilted salad and I think she liked to use butter lettuce. Mom made it once and never again! She was in one of her diet modes, I think! But that’s when I fell in love with wilted salad. I had totally not thought of that salad for years and you’re right it was the rage in the 70’s and likely 80’s. It was often eaten at business lunches by those trying to watch their waist line. I’m going to put on my Jerry Garcia t-shirt (if it still fits) and get way into this salad. LOL Ron! I think I wore Levi 501’s, rolled up and hiking boots a lot and for “good” I seem to remember having a bunch of those Indian type print and batik skirts!! I love spinach salads! I usually add also pecans… so yummy! Pecans would be a great addition – they’re one of my fave nuts! Especially for baking.